In our article on Structural Diversification we explored the idea of holding a universe of assets which, when assembled in thoughtful proportion, might be expected to protect investors against the four major market regimes that they might encounter over the long term. In that article we applied an understanding of the theoretical financial pricing drivers of each asset to engineer a theoretically diversified portfolio. For example, we theorized how bonds should respond to changes in growth and inflation expectations versus how gold or developed market stocks might respond. …then we can feel relatively confident that the portfolio will achieve our stated goal of providing consistent positive real returns in any environment. Unfortunately, there are many reasons to doubt these three strong assumptions. Much ambiguity still exists about the relative sensitivity of assets to changes in growth expectations versus changes in interest rates. We also know from our naive risk parity article that asset risk changes – sometimes dramatically – through time. Later in this article we will demonstrate how correlations change too, and how that impacts assets’ marginal risk. Lastly, it is naive in the extreme to believe that asset pricing can be decomposed into just two factors. For example, fixed income assets, even Treasuries, may be sensitive to other sources of risk, such as credit risk as we are beginning to witness with recent downgrades of U.S. debt markets. Gold and commodities also react differently to different types of inflation and growth. And these are just a few examples of how our assumptions may not hold through time. When we have cause to doubt our foundational assumptions, we must begin to contemplate whether we can engineer diversification in other ways. This prompts the question, “What can we assume about the long-term character of asset returns, and what can we estimate dynamically in order to reduce our reliance on these assumptions?” Figure 1 proposes a decision waterfall whereby investors can choose an appropriate portfolio construction methodology on the basis of what they assume about assets versus what asset parameters they feel confident they can estimate over time. In this article we will introduce methods to quantitatively account for the diversification properties of assets in the portfolio in order to equally distribute the total risk in portfolios rather than equally distributing nominal risk. In keeping with the fairly loose nomenclature around these concepts in the literature, we will brand frameworks that help to balance the total risk in portfolios ‘robust’ risk parity, in contrast to the ‘naive’ risk parity explored in the last article. As such, we have revealed a new section of our Portfolio Optimization Machine corresponding to what we will discuss today. Remember that naive risk parity weights are proportional to the inverse of asset volatilities, so that higher volatility assets will have a smaller weight in the portfolio, and vice versa. In effect, naive risk parity implicitly assumes that all asset pairs have a correlation of 1. This is a strong assumption. In this case, the risk contribution of each asset is considered to be equal to the weight of the asset in the portfolio times asset’s volatility alone. If the goal is to equally distribute the naive risk of assets in the portfolio, we weight each asset in proportion to the inverse of its volatility. Perhaps the most formal and widely recognized approach to robust risk parity is Equal Risk Contribution (ERC) (Maillard et. al., 2008). Maillard described a process for allocating to assets with the goal of equally distributing assets’ Total Risk Contribution (TRC). When optimizing for ERC, portfolio weights are derived exclusively using estimates of the variance/covariance matrix such that we define an asset’s Total Risk Contribution in terms of the asset’s weight in the portfolio times the covariance of the asset with the portfolio itself. Unfortunately, the process to derive portfolio weights that formally equalize Total Risk Contribution (i.e. form the ERC portfolio) are mathematically and computationally complex, so a demonstration of this method is beyond the scope of this article. However, we thought it might be instructive to contrast Figure 3 and Figure 4 in the naive risk parity article, which showed the contribution of each asset’s naive risk (volatility) through time and resulting weights, with their ERC analogs. We have reproduced all four figures below for easy comparison. It is instructive to focus on IEF in the charts because the intermediate term Treasury ETF has a low correlation with the other assets in the portfolio (except TLT), and it also has a relatively low volatility. Note how the orange area corresponding to IEF’s naive risk contribution in Figure 1 is larger than the area corresponding to its Total Risk Contribution in Figure 2. 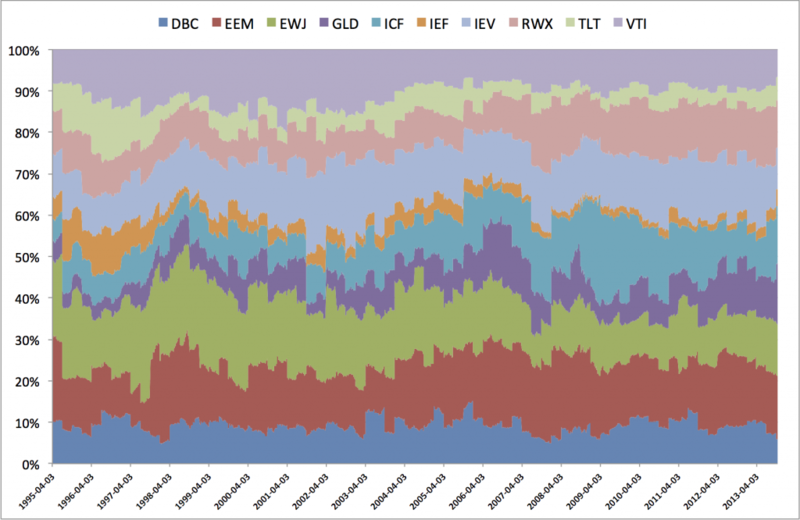 This highlights the fact that IEF’s volatility contribution is attenuated by the fact that it also has a very low correlation with the other assets, and therefore acts as a portfolio diversifier. If we flip it around and look at the weights (which are proportional to the inverse of risk contribution), you will observe that indeed IEF has a higher weight in the ERC framework than it does in the naive risk parity framework. The average weight of IEF in the naive risk parity approach is 20% while the average weight in the ERC framework is 27%. 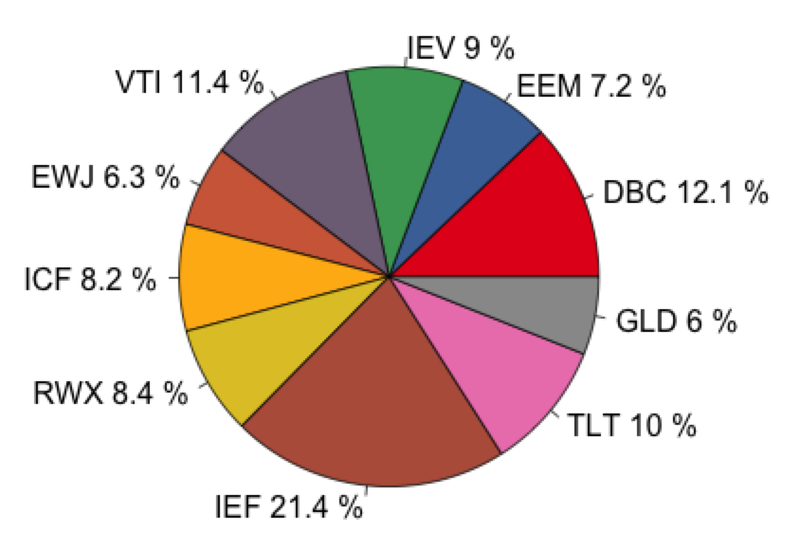 Given that the difference between the naive risk parity weight and the ERC weight is the result of diversification impact, we might say that the diversification impact of IEF reduces its total risk contribution to the portfolio by (27% – 20%)/20% = 35% relative to its estimated contribution under naive risk parity assumptions. As mentioned above, while ERC is often considered the most formal method of deriving the robust risk parity portfolio, it is quite involved mathematically, and perhaps not very intuitive for the uninitiated. Another valid method of deriving a robust risk parity portfolio involves the use of ‘clusters. The seminal work in this area (to my knowledge) was introduced by David Varadi in partnership with Michael Kapler (2013). I strongly urge you to surf on over to the above links to explore the concept in more detail; Michael Kapler in particular has shared a great deal of R code for those who want to attempt to do it themselves, and his Systematic Investor Toolbox is a treasure trove for nascent (and more experienced!) quants. It is useful to think about correlation as a measure of similarity, such that strong correlation implies a high degree of similarity. Conversely, weak or negative correlation implies a high degree of dissimilarity. In this way, dissimilarity is analogous to diversification. Therefore we can create a dissimilarity matrix by imposing the negative of the correlation matrix. A cursory inspection of the dissimilarity matrix makes it clear which assets are quantitatively quite similar to each other, and which assets are dissimilar. We can formalize this analysis mathematically by applying techniques that organize the assets in the portfolio into clusters of assets, where assets within a cluster are very similar to each other while the clusters themselves are quite dissimilar from one another. The mathematical derivation of this process (kmeans) is again beyond the scope of this article, but Michael Kapler has graciously provided all of the R code needed to perform the analysis yourself (here). The following charts illustrate the quantitatively derived asset clusters currently in force from asset correlations year-to-date in 2013. 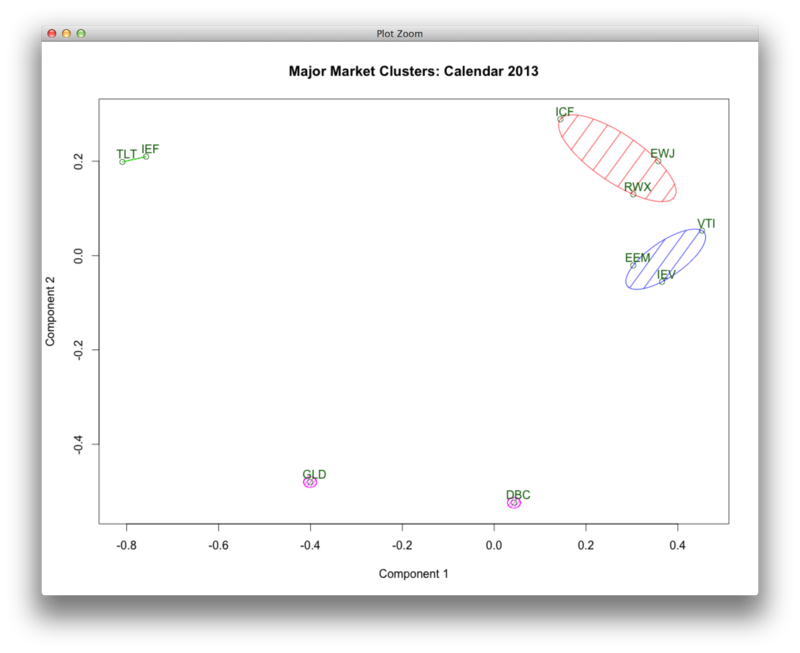 You can see how assets in close proximity to each other in ‘correlation space’ are grouped together into clusters. Currently 5 clusters explain about 95% of the total variance of our basket of 10 assets. It’s comforting to note that most of the assets fall into clusters that confirm, for the most part, our understanding of the fundamental asset classes: high quality fixed income (TLT,IEF,TIP,LQD) form a cluster, as do equities and real estate (VTI,EFA,EEM,ICF,RWX). Gold and commodities are behaving quite different from each other of late, and so each earns its own cluster this year. Interestingly, the real estate assets are split up in terms of clusters despite being fairly proximate on the chart. The real estate ETFs are lumped in with Japanese stocks. It is perhaps more intuitive to view the clusters in terms of how they might look in a portfolio. The following pie charts compare a traditional equal weight portfolio with a portfolio where each asset within a cluster receives equal weight, and each individual cluster also receives equal weight. We’ve demarcated the boundaries between clusters with thick black lines. 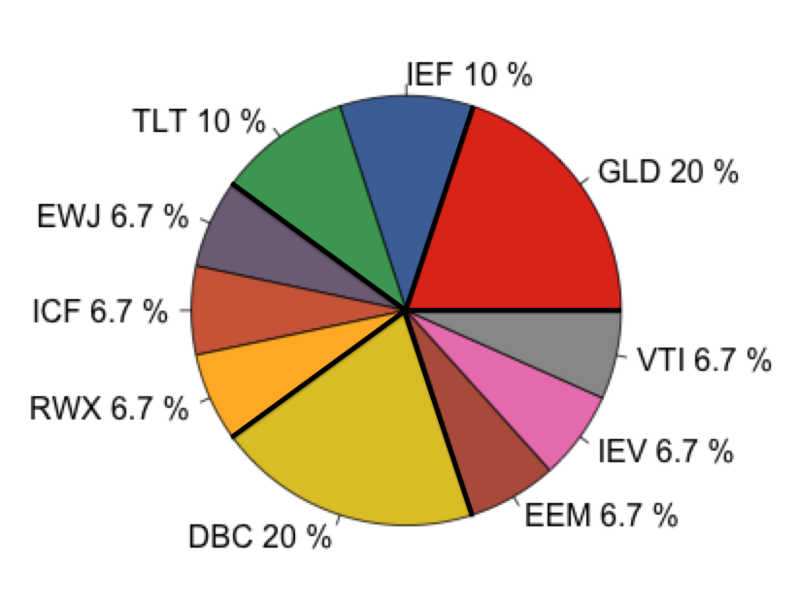 Closer observation of the equal cluster weight portfolio above reveals that the low volatility fixed income cluster consisting of both IEF and TLT receives the same nominal allocation as the equity cluster (VTI,IEV,EEM), while gold and commodities each receive the same weight in the portfolio as all the fixed income assets together. 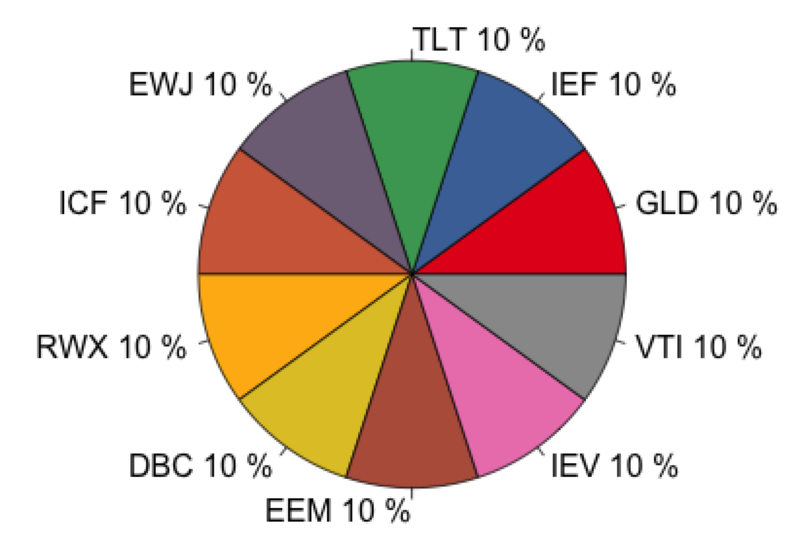 In fact IEF and TLT receive the same allocation in the equal cluster wieght portfolio as they do in a traditional equal weight portfolio. This is obviously problematic from the perspective of risk contribution. 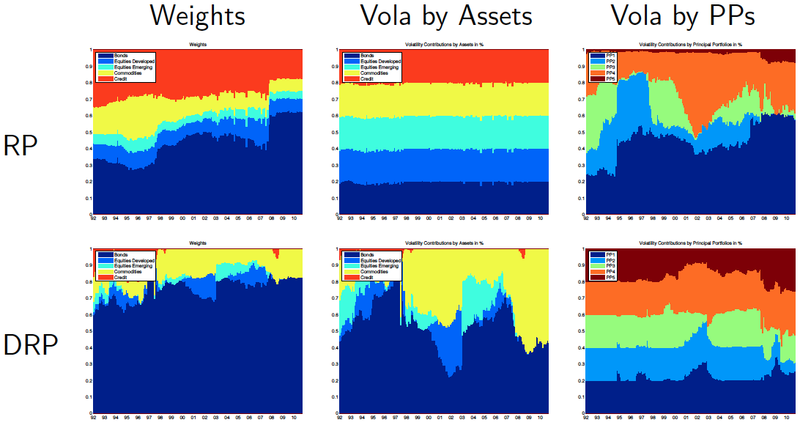 Above we analyzed the challenges with equally allocating between assets with very different volatility profiles: higher risk assets come to dominate the aggregate risk of the portfolio. The same concept applies to clusters. Furthermore, low volatility assets which might otherwise have an opportunity to act as strong diversifiers in the portfolio – like bonds – are marginalized by their low relative risk. We would note that, in addition to the cluster methods described above, Varadi and Kapler also contributed some less mathematically rigorous, but quite prospective, heuristic methods under the broad heading of ‘Minimum Correlation Algorithms‘ or MinCorr. The MinCorr methods achieve diversification by reducing the dimensionality of the correlation matrix via averaging and simple transforms. For example, the Total Risk Contribution for each asset is approximated as a function of the average of its respective column (not including the unit diagonal row) in the correlation matrix, and the asset’s individual variance. The data is transformed in some simple ways (rank, Gaussian) to ensure all weights are positive. Let’s examine the third assumption in particular, which asserts that asset prices are driven by just two factors: changes in growth and inflation expectations. Can this really be true? Is it not possible, for example, that assets are sensitive to drivers such as monetary policy, sentiment, political risk, herding, or a host of other factors that emerge and dissipate through time? Why should we restrict our diversification framework to just the growth and inflation dimensions when assets are surely driven by other factors as well over time? Meucci (2007, 2009) proposed a concept of distributing risk equally across the true empirical factors that drive portfolio volatility. Under Meucci’s framework, it is not necessary to make the strong assumptions above because the true independent drivers of portfolio returns can be derived mathematically from the assets’ variance/covariance matrix. The process used to extract these factors – principal component analysis – serves to create several new portfolios made up of the original assets, but where the return series for each new portfolio describes the impact of the independent factors that are actually driving portfolio returns. Meucci called these new portfolios ‘Principal Portfolios’. Importantly, the factors described by principal portfolios do not necessarily map directly to traditional portfolio drivers; you can’t be sure that Principal Portfolio 1 (or Factor 1) is analogous to a growth or inflation factor, for example. However, it is often possible to approximate some traditional meaning from a principal portfolio factor by inspecting its composition. For example, Lohre et. al. 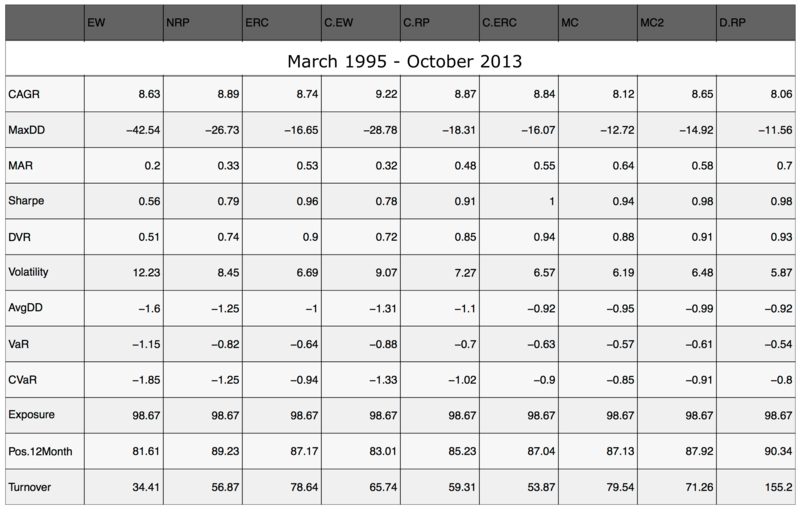 (2013) analyzed the factor portfolios for a simple universe consisting of government bonds, developed market stocks, emerging market stocks, commodities and credit, based on monthly return data from 1987 – 2011. The numbers in each column correspond to each asset’s ‘loading’ within the principal portfolio, or in other words the principal portfolio’s sensitivity to that asset class. All of the loadings are standardized between -1 and 1. Note that Principal Portfolio 1 (PP1) has large positive exposures or loadings on emerging and developed equity markets, so Lohre makes the logical leap that PP1 tracks the global equity beta factor. An equally plausible explanation might be that PP1 tracks global growth; emerging markets are obviously more sensitive to this dynamic than developed equities. PP2 meanwhile is very heavily loaded on commodities with small negative loadings on equities and fixed income, so Lohre speculates PP2 relates to the diversification potential of commodities relative to equities. One might alternatively speculate that PP2 relates to inflation. PP3 is long emerging equities and short developed equities, suggesting that PP3 tracks the return spread between emerging and developed equities. PP4 loads meaningfully on the two fixed income assets, implying an interest rate analog, while PP% loads positively on credit and negatively on government bonds, indicating a credit spread factor. It is instructive to observe the difference between Maillard’s Equal Risk Contribution portfolio and Meucci’s Diversified Risk Parity portfolio in terms of their distribution of asset weights, asset total risk contribution, and principal portfolio risk contribution. Lohre provides superb visualizations of these concepts in his paper, which we have extracted into Figure 10. 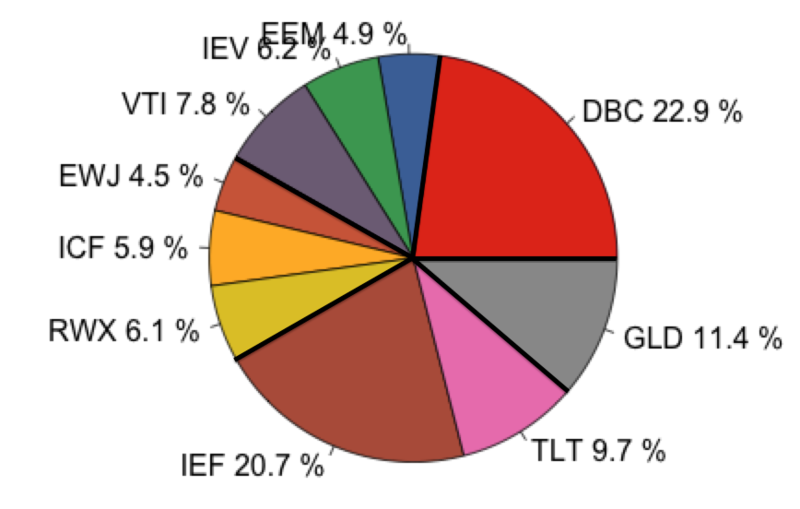 Note how traditional ERC (labeled RP in Figure 10) does an excellent job of equally distributing asset total risk contribution in the portfolio, as represented by the near perfect rainbow of colours in column 2 of the diagram. 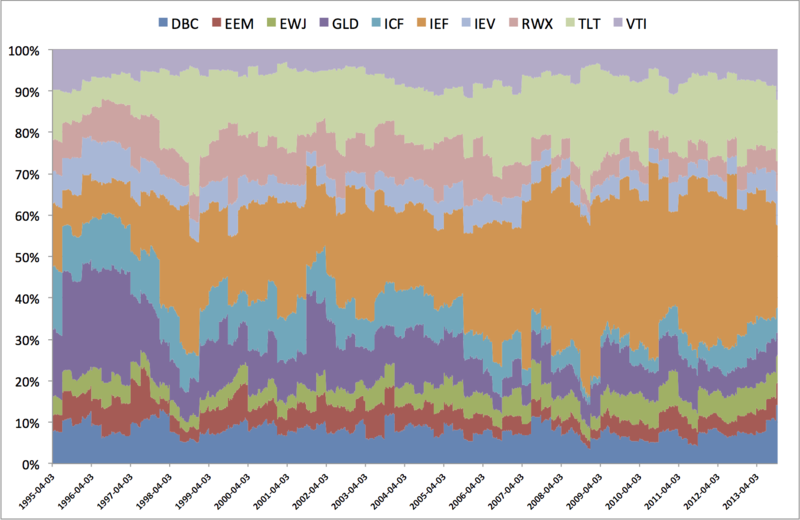 However, ERC does a relatively poor job of diversifying risk across principal portfolios, as can clearly be observed in the chart showing the volatility contribution by principal portfolio. Note ERC’s very concentrated exposures to Principal Portfolios 1 and 4, with virtually no exposure to factors 2, 3 and 5. In other words, ERC is ineffective at ensuring that the portfolio is equally distributed across the latent drivers of asset prices over time. In contrast, Meucci’s Diversified Risk Parity (DRP) approach is unconcerned with diversifying marginal risk across individual assets, as can can clearly be seen by inspecting the middle image under DRP. Rather, DRP is concerned with equally distributing risk across the latent portfolio factors – principal portfolios – to ensure equal exposure to all of the major sources of portfolio risk rather than equal exposure to individual asset risk. Note that the principal portfolio risk chart in Figure 1 is not totally balanced at all times because of the no shorting constraint; otherwise the right most chart in the second row would closely resemble the middle chart in the first row. It is further interesting to note that, while DRP does a more effective job of diversifying across the latent drivers of portfolio variance, it results in a more concentrated portfolio from the perspective of asset weights. In particular, DRP results in very large and persistent exposure to global bonds and more limited but still persistent exposure to commodities, but only limited, intermittent rotation between developed and emerging equities. 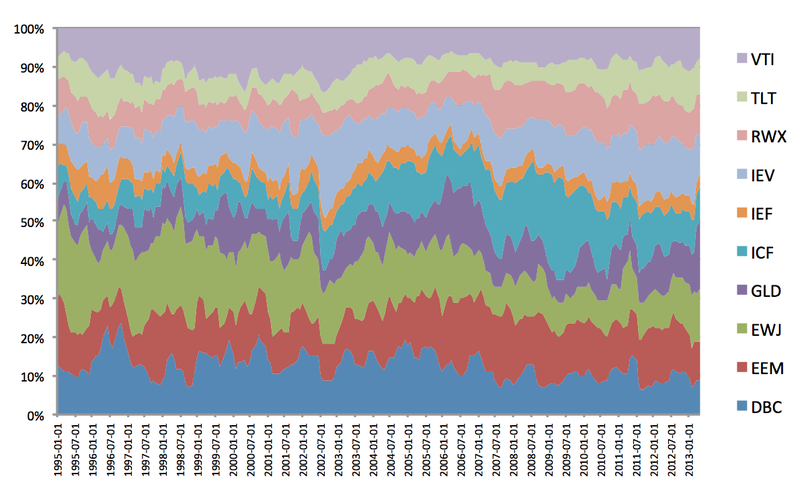 However, despite the low and sporadic allocation to equities in the DRP portfolio according to Lohre’s 5 asset class simulations, it still managed to outperform ERC, equal weight and other optimization methods from 1993 – 2011 (Figure 11). DRP (including the constrained long-only version) exhibited outperformance in terms of both total returns and Sharpe ratio, and maximum drawdowns were competitive with the Minimum Variance portfolio. Figures 11 and 12 summarize the results of simulations using each of the methods described above on the same broad asset class universe we used in the Naive Risk Parity (NRP) simulations. The NRP tests revealed a high degree of sensitivity to the asset universe chosen for optimization. While some of the NRP methods did a good job of reducing portfolio volatility and improving Sharpe ratios when applied to our well specified 10 asset universe, we observed virtually no improvement in these metrics in simulations on a larger, equity biased, noisier universe which we’ve named ‘Dog’s Breakfast’. 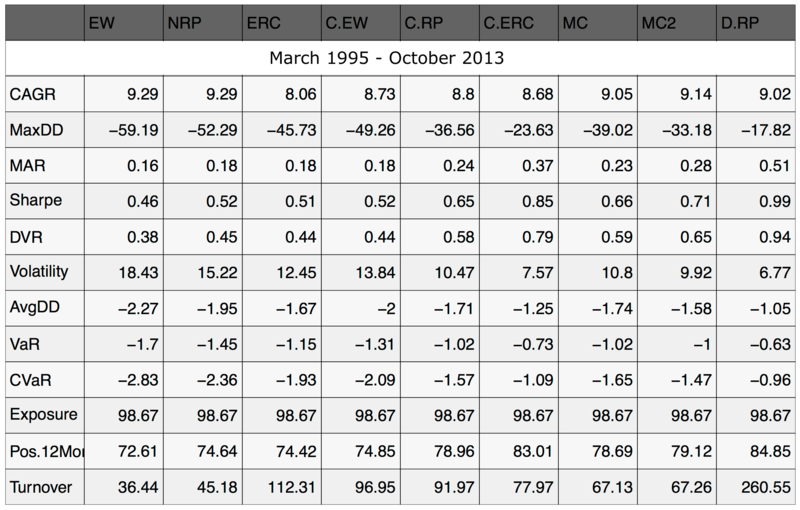 We are interested in discovering how well robust risk parity techniques perform on these same universes, so we ran simulations using each of the methods described above over the period 1995 – 2013, with quarterly rebalancing. The universe above is very well specified by many important measures, so it does not do a very good job of demonstrating the inherent weaknesses of risk parity approaches. In contrast, the universe below, which consists of 35 different equity universes along with REITs, gold, commodities, and 1 intermediate-term Treasury index clearly exposes the limitations of risk parity, as the massive overweight in equities swamps the diversification of alternative asset classes. Where possible we have extended the horizon of ETFs back through time using their respective total return indices. We will call this universe our ‘Dog’s Breakfast’ universe for lack of a better name. Note that all Sharpe ratios in the performance tables below are net of the 3 month T-bill rate. The purpose of this article was to extend the concepts first proposed in our article on Structural Diversification into a dynamic framework. We described the strong assumptions embedded in passive methods of diversification, and offered reasons to question those assumptions. We then explored a variety of methods for dynamically engineering optimal portfolio diversification through time using evolving estimates of asset correlations and variances. We examined the Equal Risk Contribution framework proposed by Maillard and extended by Roncalli; cluster risk parity and heuristic minimum correlation methods proposed by Varadi and Kapler (2012), and; Meucci’s diversified risk parity framework involving principal portfolios. The principal portfolio framework allowed us to examine the true number of diversified ‘bets’ in different types of risk parity portfolios. We discovered that while the Equal Risk Contribution method definitionally equalizes each individual assets‘ contribution to total portfolio volatility, it can result in portfolios that have concentrated exposures to a small number of latent portfolio drivers. 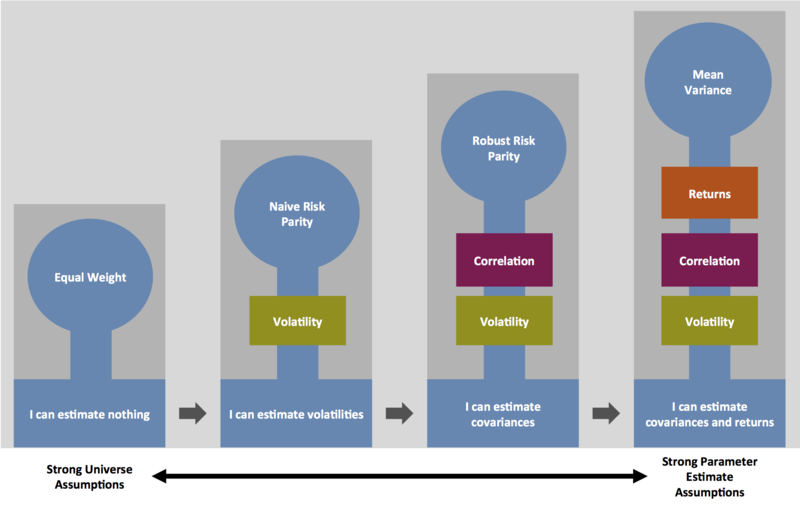 In contrast, the objective of Diversified Risk Parity is to equalize exposures to the underlying drivers of portfolio variance, and the method effectively achieves this objective even under long-only constraints. 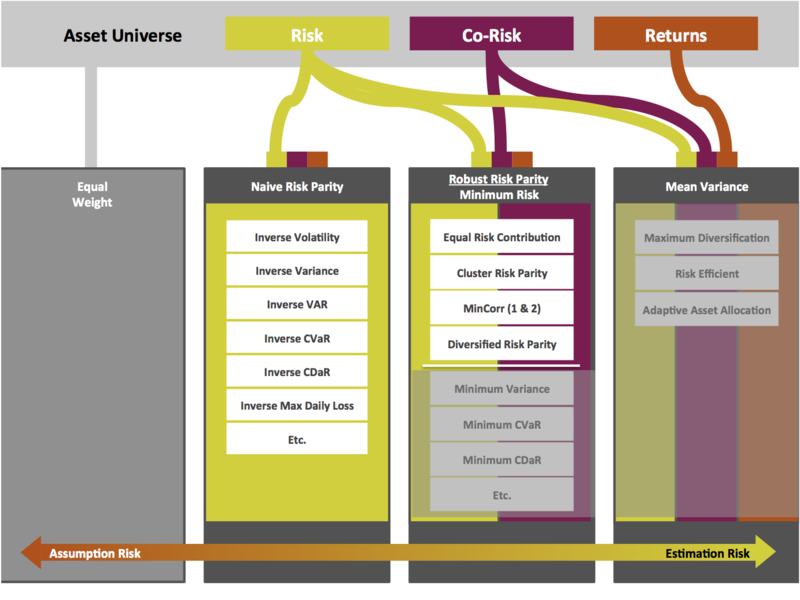 In scrutinizing results of simulations across our two asset universes, we observe that the risk profile of the Diversified Risk Parity approach is consistently lower than all other methods across both universes. Further, DRP exhibits a higher Sharpe ratio than ERC in both universes, though a combination of ERC and Clusters delivered competitive Sharpe ratios and higher returns than DRP for the 10 asset universe. Further, applying ERC with clusters results in about 2/3 less turnover than DRP. Thus we conclude that DRP and the application of Equal Risk Contribution within and across clusters are both highly robust methods to achieve true risk parity, but that the cluster ERC method may be preferable because turnover is less onerous. Our next instalment in this series will deal with minimum risk algorithms, including minimum variance, minimum VaR, minimum CVaR and other methods.